Until, on the tube platform, I came up with a passable analogy. MGMT and Crazy P are artists you listen to for their enjoyability. You put them on and soon a smile will creep across your face and your mood will lighten and brighten. Radiohead, though one of my favourite artists, is not what I’d define as enjoyable. I love them. I listen to them often, but when I listen to OK Computer it’s a more thoughtful and meditative experience. Afterwards I might say I enjoyed it, but at the time it’s – I wouldn’t say depressing – but perhaps, haunting. 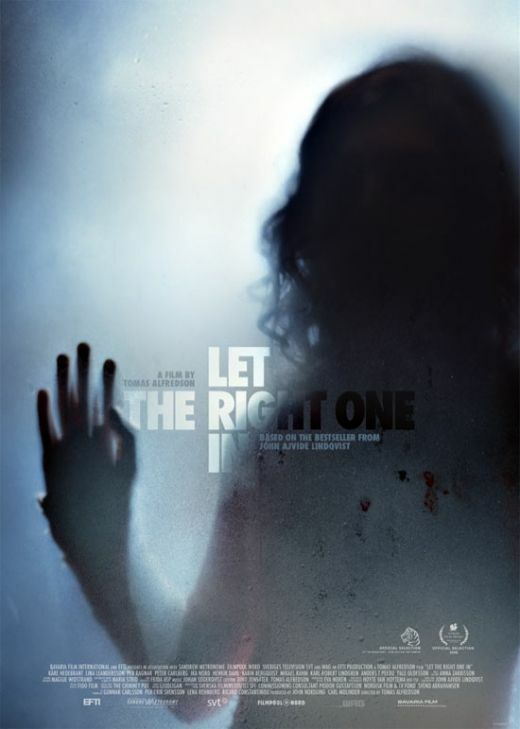 Let the Right one in is the Radiohead of films. Much like Hunger or Once were Warriors it deals with real people/characters in real, and really awful situations. It’s brilliant and emotional and devastating all at the same time. Amazingly and cleverly shot for what must’ve been a small budget, with minimal effects. The stark snowy landscape and dreary apartments set the scene for a tragic story of friendship and survival. Without giving too much away, it’s the story of a young boy, Oskar, who befriends a new girl in his building, Eli. Mysteriously, she doesn’t feel the cold, go to school or come out during the day. She asks to be invited into his house and is ill when she eats a sweet he gives her. Seems pretty obvious really, but it takes Oskar a while to realise the truth. When he does, it doesn’t effect their friendship, but of course, nothing quite works out how anyone planned it or hoped for it to be. (Well, otherwise it wouldn’t be much of a story would it). This film puts Interview with a Vampire‘s take on children who never age to shame. The tragedy of Eli’s story can be felt at every turn. She is almost constantly hungry, unable to fend for herself and stuck in this life she didn’t choose, unable to escape. She shows mercy for her victims, regret and despair at the suffering of her companion but also frustration at his inability to help her, and a simple kind of happiness when she becomes closer to Oskar. Saying any more will only spoil it – if I haven’t already! It’s an amazing film – it was recommended to us (not personally, but to the audience) by Danny Boyle at a screening of Slumdog Millionaire and I would say that calling this a ‘vampire movie’ is about as good a description as calling Slumdog a ‘feelgood movie’ (something Danny Boyle hated). But it is an emotional, haunting film and – although not terribly gory – it’s not for anyone feeling even the slightest bit queasy. Will I watch it again though? I’ll probably buy it on DVD/BD, but it will sit on the shelf for a long time before I actually feel up to watching it again! Watch this if you like: 28 Days Later or weren’t satisfied with Interview with a Vampire, but not if you’re a Twilight fan. This entry was posted in film review, films. Bookmark the permalink.